I am hoping someone who has the Mainship 30 Pilot II Sedan or a similar setup could help me with the best options to snake wires from the helm to the hardtop and also to the cabin. I am planning to install some new electronics that need wiring to the hardtop as well as a TV and a couple of 12v outlets to the port and starboard cabin space. The hardtop has great access panels and tunnels overhead once the wires make it up there, but I can see no easy way to snake the wires to the hardtop access panels from the helm below. Apparently both the port and starboard sides have tunnels within the walls of the supporting hardtop structure that connect to the hardtop access panels. I cannot see any easy way to access these tunnels from within the hinged helm electronics access space. The route to the cabin wiring is equally mysterious (runs behind or above the head in the cabin to starboard and who knows where to cross over to the port side for wiring to port tunnel to the hardtop or to the galley below). Any suggestions would be appreciated. I have included a couple of photos. In the image below, the heavy wire to the right of the starboard front window is the radar wire which goes to the access panel where the fan is. I assume it's not within the tunnel because of it's thickness. The access panels on the hardtop make snaking wire easy, it's getting the wire up here that is the problem. It appears there are 2 tunnels to the hard top, one on the starboard side and one on the port. The present gps antenna runs up the port tunnel and the starboard tunnel holds most of the power wires for lights, fans, etc. 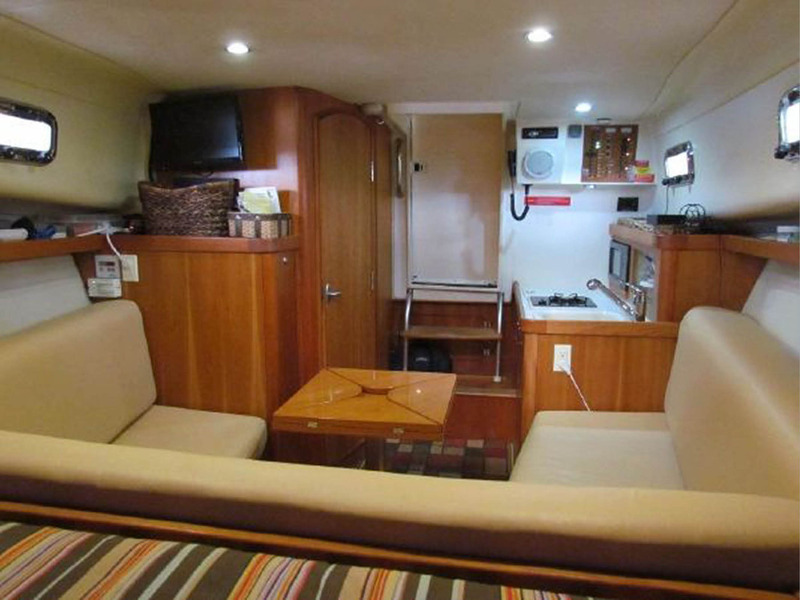 The image below is from a sister ship but looks like my interior. I would like to add a TV in a similar position above the locker on the starboard side, I need to be able to run 12v and a TV antenna cable from the helm. 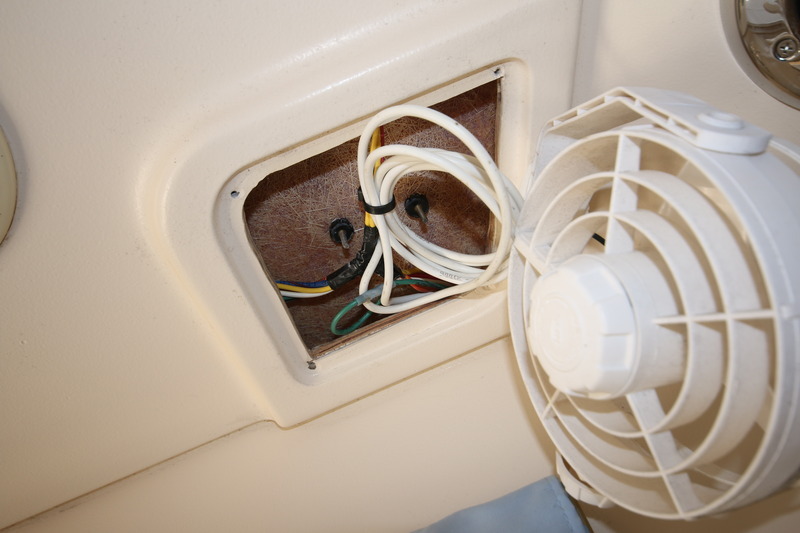 I would also like to run a 12v outlet to the port side galley. I am trying to solve that same issue. I have a2006 pilot 30 hardtop. I was looking to add a spotlight on the hard top roof but struggling with a path. I was considering adding a wood trim piece with a channel in the back to conceal the cable. Looking at the picture of your cockpit answered another project question of mine. Adding a wiper to the opening center window. Did you add that? I did find that factory wiring for a center wiper is already in place in the hardtop. Hopefully another P30 hardtop owner will chime in. RT Firefly, Send in the snake to eat the mouse...then I'd need to send in the mongoose to eat the snake..kind of like the old woman who swallowed a fly story. I'm afraid with all the dead animals in there it would be impossible to ever get a wire through, not to mention the smell. MyLuna, The wiper was already installed. We just recently bought the boat and were lucky enough to have our sea trial on a windy/choppy day. We all agreed how well the Mainship preformed in the chop and the fact that without the center wiper, visibility would have been greatly diminished. I have seen them on very few other Mainship 30's. The radar cable is neatly zip tied and screwed onto the corner between the helm and hardtop but even here there is no direct visible way to run it from inside the hinged helm compartment to the hole in the helm at the corner where it begins it assent through and up towards the hardtop. I don't plan to but if I were to cover the exposed cable I'd use starboard not wood. Bob Cofer has a spare pipe that he recently removed from his GB32. 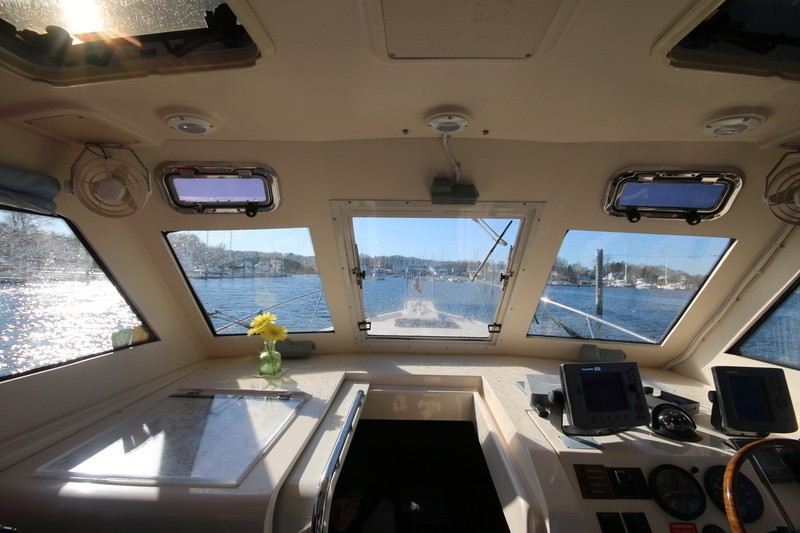 It took all those pesky wires from the helm to the flybridge. He might be persuaded to part with it for you to install on your boat. have you tried the 'fish poles' available at HD or lowes, etc., that let you push or pull the flexible fiberglass whip around curves and other stuff and then tie your wires onto the end of the whip and pull it back in. Next time, leave a pull string in the chase for the next time you wanna do it. A set of fish poles (4-5 sections) are about $20 and they all screw together and make about 20' long pole. The fish poles are a good idea for running pretty straight cable runs and I'll pick up a set because I'm sure I'll be able to use them. I did some research on YouTube and came up with a couple of other ideas which look like they will help as well. The Vacuum idea might need to be modified to adding several feet of 3/8 or 1/2 inch soft plastic tubing to the vacuum nozzle to run into the tunnel to catch the end of a string at the interior right angle where the tunnel opens into the panel that's not so accessible. Directly connecting the vacuum nozzle to Hardtop tunnel with some tape may or may not provide enough vacuum to work. Lots of ideas!